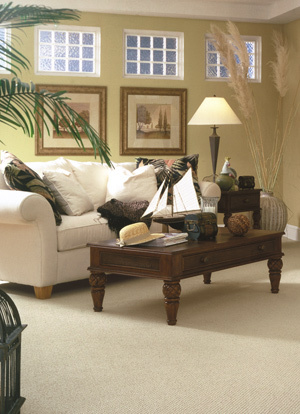 New neutral toned carpets make a home inviting to prospective buyers. Present Your Home In The Best Light Possible And Maximize Your Return. When you are trying to sell your home, it is important that your investment look its best. New “Real Estate” carpet and vinyl update the home, making a great first impression. These real estate products are first quality goods, but because we buy them in bulk, they cost much less. Buyers will positively respond to the new carpet and flooring. Plus, homes with new flooring sell faster and for more money. Classic Carpet & Flooring has installed thousands and thousands of yards of real estate materials for realtors and homeowners across the St. Louis area. Here are a few reasons we have found that it makes sense to upgrade your carpet and vinyl before you hit the market. Visual Impact: New neutral floorcovering makes a big impact on prospective home buyers. The neutral colors make it easy for the buyer to visualize the home coordinating with their decorating tastes. Plus, the fresh look that comes from new flooring sets the home apart from others in the neighborhood. Proven Results: Realtors agree that homes with new neutral carpeting sell faster than homes with older, worn out flooring. The new look sets the home apart from competition in the neighborhood. In addition, homes with new flooring sell for more money. Great Service: Our friendly and efficient sales staff can give you a free estimate on your flooring. Our shop-at-home service allows you to view samples in your home. Plus, we stock everything you need, so we can schedule installation quickly, giving you new carpet usually within a week. Free Financing: Six months free financing with no interest charges with approved credit. This should allow payment for your new carpet and vinyl after your home has sold. Discounted Pricing: We purchase first quality goods direct from the manufacturer in bulk for real estate installations and pass the savings on to you. We guarantee our prices will beat any bid on comparable products. Affordable Products: We stock a 30 oz neutral carpet and several neutral vinyls, bought in bulk to save you money. The quality of products ensures that your floors will continue to look good throughout the home selling process. Plus, your buyer will have the benefit of all manufacturers’ warranties on their new carpet. Quality installation: Our installation crews are experienced installers who are insured, certified, and professional. We arrive on time, move furniture, dispose of the existing carpet, and vaccuum every real estate installation so that they are ready to show. We use only fully warranteed materials and guarantee all of our installations.